In Madagascar, an island known for its exceptional biodiversity, 70% of the population lives below the poverty line, according to UN figures. To make matters worse, the global economic crisis and the political crisis of 2009, marked by the departure of President-elect have hurt the tourist industry and the local economy, forced transformation. The textile industry, for example, meeets troubles to resist the competition from China and many factories have closed recently, reports economist Razakaharivelo Charlot, one of the best local experts in microfinance. In this context, microfinance institutions can develop complementary activities and non-relocatable trade, crafts and agriculture, to name only three sectors financed by microcredit. They allow Malagasy live despite the difficulties, possibly out of the informal economy ... and pass the famous "fihavanana" social ties and solidarity traditional Malagasy. 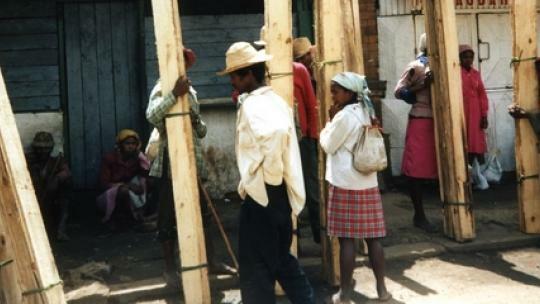 Today, microfinance for about 19% of households, according to 2011 figures from the Treasury Madagascar. This is a first success for an industry born in the early 1990s. It is to the credit of three types of actors: Microfinance Institutions (MFIs), mutual, as CECAM (Savings and mutual agricultural credit), as non-cooperative MFIs Microcred (PlaNet Finance Group) and MFI associations. In the coming years, the sector faces three main challenges, says Charlot Razakaharivelo. First, it must cover a larger proportion of the population, as the traditional banking sector affects only 4% of households. Then the smaller institutions (type I, according to the law) should become more professional and appropriate, eg computerized management systems. These would include platform to connect with the "central risk" created to fight against over-indebtedness. But professionalism is also vital, says expert to convince donors. Third challenge, better customer protection. To move forward on this project, several MFIs, including CECAM, as well as access Microcred Bank and are already involved in the international campaign Smart defending the seven principles of client protection. But much remains to be done in this area, especially that "The right of the consumer is a very new concept in Madagascar," says Charlot Razakaharivelo. Beyond these issues, microfinance actors experimenting with new services, including banking services via mobile, could significantly contribute to the dissemination of the savings and credit, with 40% of the Malagasy population now has a mobile phone. Several mobile operators, including Orange Madagascar, and work on money transfer applications, particularly useful for exchange with the Malagasy expatriates.